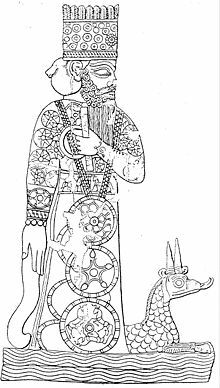 Marduk, the heroic deity of the Enuma Elish. Enûma Eliš (also transliterated Enuma Elish) is the Babylonian or Mesopotamian creation epic, composed probably in the eighteenth century B.C.E. A fragmentary copy written in the seventh century B.C.E. was first discovered by modern scholars in the ruined library of Ashurbanipal at Nineveh, near modern Mosul, Iraq, in 1875. Enûma Elish has about a thousand lines and was recorded in Akkadian on seven clay tablets. This epic is one of the most important sources for understanding the Babylonian worldview, centered on the supremacy of the god Marduk and the creation of humankind as the servants of the gods. One of its primary purposes seems to be the elevation of Marduk, the chief god of Babylon, above other older Mesopotamian deities. Many scholars see connections between Enuma Elish and the creation story of Genesis 1, as well as the ancient Greek writer Hesiod's account of the early battles of the Olympian gods and Titans, and Canaanite mythology explaining the supremacy of Baal over other older gods. The Genesis parallel, however, is notable for its difference, as stately creation by the word replaces the motif of creation out of conflict. The title of Enuma Elish means "When on High," derived from the story’s opening line. The epic describes two primeval gods: Apsu (representing the upper, fresh waters) and Tiamat (goddess of the lower, salt waters), whose fluids join to generate creation. Several other gods spring from the union of the original pair. However, disharmony prevails, and Apsu is provoked to move against the younger gods. Ea, the wisest of the deities, learns of the plan, puts Apsu to sleep, and kills him. Ea then begets a son, Marduk, greater still than himself. Tiamat is persuaded to take revenge for the death of her husband. She creates an army of titanic monsters, and some of the other gods join her. She elevates Kingu as her new husband and gives him supreme dominion. The gods who oppose her tyranny are powerless against Tiamat and Kingu and elect the glorious young Marduk as their champion. In a mighty battle, he defeats Tiamat's forces with a mighty wind, kills her, and forms the world from her corpse. Marduk then reigns as the Supreme Deity. He orders the heavens and the earth, and controls the Tablets of Destiny that Tiamat had presented to Kingu. The gods are still not at peace, however, for they must labor. Consulting with Ea and the other gods, Marduk decides to slay Kingu and use his blood to create humankind to serve the gods. Babylon is established as the residence of the chief gods. Finally, the gods confirm Marduk's kingship, singing a hymn to his glory and hailing him with 50 titles. Particularly noteworthy is Marduk's symbolic elevation over Ea and/or Enlil, who were seen by earlier Mesopotamian civilizations as the supreme. Scholars believe Enuma Elish may have served to explain Marduk’s replacement of Enlil, as well as Babylon’s superiority over other more ancient religious centers that worshiped deities such as Ea and Inana/Ishtar. Joseph Campbell and other scholars of comparative mythology have suggested that Enuma Elish also represents a continuation of a process of de-feminization that had begun centuries earlier. According to this theory, the Great Mother goddess (for example, Tiamat) once was supreme, either with or without a male consort. As warlike nomadic herdsmen began to dominate in Mesopotamian culture, they imposed their mythologies on preexisting legends. Thus, goddesses of the earth or sea such as Tiamat became villains, while male deities of the sky and storm such as Marduk came to the fore as heroes. A similar process can be seen in the Canaanite story of Baal, like Marduk a storm deity, who emerged to overshadow the earlier primordial couple of the god of heaven, El, and his consort, Lady Ashera of the sea. Cronos attacks Uranus: a later version of Ea's destruction of Apsu? Some see the Hebrew god Yahweh in a similar context. 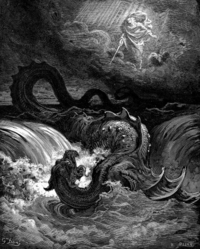 Like Marduk, he is portrayed as slaying the sea-god Leviathan (Psalm 74), and, like Baal, he came to replace both El and Ashera in the primitive Israelite pre-monotheistic pantheon. Parallels between the titanic struggles of Enuma Elish and the later theogony described in Greek and Roman mythology is also widely accepted by scholars. Here, Gaia and Uranus are the primordial couple who give birth to the Titans. Then Cronos—like Ea—destroys Uranus, and is in turn unseated by the storm deity Zeus, who becomes the king of the gods. Apsu and Tiamat mingle their waters together, causing Tiamat to give birth to heaven and earth, as well as the other deities. As the ages roll on various other divinities come into existence, including Ea, the god of intellect. However, discord arises, causing Tiamat great discomfort preventing the primordial couple from taking their rest. Apsu conspires with his first-born, Mummu, and plans to slay the younger gods. Tiamat, however, can not abide this, and she "writhes in lonely desolation." "Why must we destroy the children that we made?" Tiamat demands. "If their ways are troublesome, let us wait a little while." Apsu, however, approves of Mummu's plan. Here, Ea comes to the rescue. He speaks order out of chaos, charming the waters and causing Apsu to fall asleep and drown. He also subdues Mummu and reigns in Apsu's place. Ea builds his abode over the abyss and there with his consort Damkina conceives Marduk, who plays the decisive role in the rest of legend. Remember Apsu in your heart, your husband, remember Mummu who was defeated; now you are all alone, and thrash around in desolation, and we have lost your love, our eyes ache and we long for sleep. "Rouse up, our Mother! Pay them back and make them empty like the wind." The mighty sea-goddess approves of their plan and creates powerful weapons. She spawns terrible fanged serpents, as well as hurricanes, hell-hounds, she-monsters, and scorpion-men, a total of 11 types of horrifying monsters in all. Finally, she raises her son Kingu as her general, clothing him with royal raiment, and naming him as her spouse. Tiamat grants Kingu dominion over all of the other gods, and laying on his breast the Tablets of Destiny. Ea receives the news of Tiamat's plan to avenge Apsu. He consults with his grandfather, Ansar, who advises him to attempt to placate Tiamat. He attempts to do this but cannot and returns "cringing." Ansar's son Anu likewise tries to face Tiamat but cannot withstand her. Finally, the gods together decide that the only one equal to the task is Marduk. They declare him to be the greatest of them all and elect him as their leader and king. They bestowed upon him the scepter, and the throne, and the ring. They give him an invincible weapony which overwhelmeth the foe. “Go, and cut off the life of Tiamat, and let the wind carry her blood into secret places." Marduk arms for combat with mighty weapons, flame, and lightning bolts. He makes a net of seven winds to entrap “the inward parts” of Tiamat. He then confronts the fearsome goddess of the sea and her own champion, Kingu. Seeing Marduk’s awesome character, Kingu loses his nerve, and his companions suffer a similar loss of morale. Tiamat, however, rages against him with all her power. “Let then thy host be equipped, let thy weapons be girded on!” cries Marduk. “Stand! I and thou, let us join battle!” When Tiamat hears these words, "she was like one possessed," uttering wild, piercing cries. She trembled and shook to her very foundations. She recited an incantation, she pronounced her spell. And the gods of the battle cried out for their weapons. Tiamat and Marduk advance toward one another and Tiamat opens her horrible maw to its full extent to devour Maduk. However, he releases a mighty wind which fills and bursts her belly. He then pierces her internal organs and her very heart. Casting her body down, Marduk stands in triumphant on the body of the slain mother of the gods. Marduk proceeds to capture the gods who sided with Tiamat and to break their weapons. They "fill the world with their cries of grief." He then defeats Kingu and takes from him the coveted Tablets of Destiny. Finally, Marduk then smashes Tiamat’s skull with his club and splits her into a likeness of a huge fish or clam. One half of the titanic body becomes the sky. Then, "he stretched the immensity of the firmament, he made Esharra, the Great Palace, to be its earthly image, and Anu and Enlil and Ea had each their right stations." Next Marduk creates the Zodiac, heavenly bodies, and the god of the Sun. From the remains of Tiamat's body, "He skimmed spume from the bitter sea, heaped up the clouds, spindrift of wet and wind and cooling rain, the spittle of Tiamat." With his own hands from the steaming mist he spread the clouds. He pressed hard down the head of water, heaping mountains over it, opening springs to flow: Euphrates and Tigris rose from her eyes, but he closed the nostrils and held back their springhead. He piled huge mountains on her paps and through them drove water-holes to channel the deep sources; and high overhead he arched her tail, locked-in to the wheel of heaven; the pit was under his feet, between was the crotch, the sky's fulcrum. Now the earth had foundations and the sky its mantle. Finishing this great work of creation, Marduk turned toward the making of temples. The gods rejoice at Marduk's wonderful work, and fall prostrate at his feet in worship. Even his parents, Ea and Damkina declare: "In time past Marduk meant only 'the beloved son' but now he is king indeed, this is so!" With Ea's advice a great assembly is called to decide which one of the gods will be sacrificed to embue mankind with life. The rebellious faction agree that it should be Kingu, the one who stirred up their revolt. "They bound and held him down in front of Ea, they cut his arteries and from his blood they created man." The myth concludes with a hymn of praise to Marduk. The six days of creation in the Genesis story also parallel the six generations of gods in the Enuma Elish myth. Marduk, a sixth generation god, creates man and finally allows the gods to rest. Similarly, God (Elohim) makes man on the sixth day and He himself rests (possibly with his angels, who—in honoring the supreme God—hold a similar position to the Mesopotamian deities in relation to Marduk). However, there is a remarkable and fundamental difference between Genesis and Enuma Elish. In Genesis God is the unchallenged Creator, who creates by uttering words: "Let there be… and it was so." There is nothing of the conflict that drives the process of creation in Enuma Elish. you dried up the ever flowing rivers. ↑ Here "apsu" is used to refer to Marduk's birthplace. Campbell, Joseph. The Masks of God, Vol. 3: Occidental Mythology. Penguin, Reissue edition, 1991. ISBN 9780140194418. Cross, Frank Moore. Canaanite Myth and Hebrew Epic. Harvard University Press, 1973. ISBN 9780674091764. Dever, William G. Did God Have A Wife? Archaeology And Folk Religion In Ancient Israel. William. B. Eerdmans Publishing Company, 2005. ISBN 0802828523. Eliade, Micrea: The Sacred and The Profane: The Nature of Religion. Harvest Books, 1968. ISBN 9780156792011. Heidel, Alexander. The Babylonian Genesis: The Story of Creation. University Of Chicago Press, 1963. ISBN 9780226323992. King, Leonard William. Babylonian Religion and Mythology. Adamant Media Corporation, 2001. ISBN 9781402195266. The surviving text of Enûma Elish – www.sacred-texts.com.